Branchial cleft cysts develop during the developmental-embryonic stage when there is abnormal or improper neck or collarbone tissue development. Branchial cleft cysts can be noticeable and look like an opening on one or both sides of the neck. The openings drain fluid, leading to the formation of a pocket or cyst. Sometimes there's infection in the pocket or cyst which oozes out of the skin's opening. 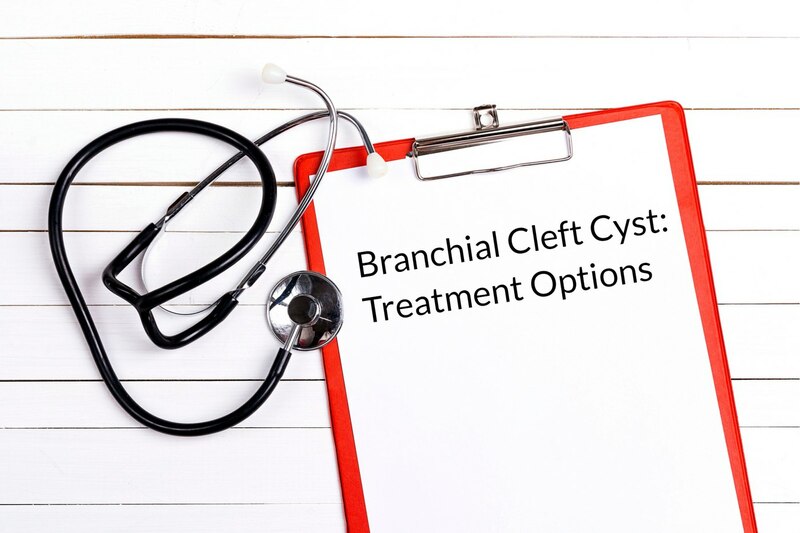 Most of the time, branchial cleft cysts aren't harmful, and they usually don’t provide the ENT doctor a diagnostic challenge since they tend to have a consistent clinical presentation and physical locations. In most cases, the doctor can perform a thorough physical exam derive at a branchial cleft cyst diagnosis, and that may be all that's needed. The specific area of the fistula opening or mass on the skin can generally help the physician arrive at a diagnosis. However, unless it's painful or becomes infected, a branchial cleft cyst could go unnoticed. Any or a combination of these three imaging tests may be required to confirm the diagnosis. A computerized tomography scan (CAT or CT scan) uses rotating X-ray machines and computers to generate cross-sectional body images. The images provide the doctor with much more detailed data than regular X-ray images. They allow the doctor to see the blood vessels, soft tissues and bones in various areas of the body. During a CAT scan, you'll lie down inside a tunnel-like machine. The machine rotates on the inside taking a series of different angled X-ray images. The pictures are then uploaded to a computer and then combined to generate images of cross-sections or slices of your body. They might even generate a 3-D image of a certain part of the body — such as the neck, for example. An ultrasound scan captures live images through high-frequency sound waves of the inside of the body. The doctor can use the ultrasound to detect issues with blood vessels, organs or tissues without having to make an incision. Ultrasound doesn't use radiation like other imaging techniques do. MRI stands for magnetic resonance imaging and uses radio waves and a large magnet to look at structures and organs inside the body. Doctors use MRI scans to diagnose a number of conditions from tumors to torn ligaments — in this case, a branchial cleft cyst. Your child lies down on a table during the scan, which slides inside a tunnel-shaped machine. You have to remain still. The scan doesn't cause any pain, but it can take a while to complete, making "staying still" uncomfortable. It also makes a lot of noise, so the technician might provide your child with earplugs. Sometimes, the doctor might decide they require a small sample of cells or tissue to help them diagnose a branchial cleft cyst. They'll perform a biopsy to remove this sample for analysis. Although a biopsy might sound painful, most cause no pain and are risk-free procedures. The sample the doctor takes is sent to the lab for testing. The doctor may require additional testing, including performing a fine needle aspiration for microscopic examination of the fluid. The physician inserts a small needle into the cyst to collect fluid they can analyze. Infection: Most branchial cleft cysts are asymptomatic; however, they can become infected and begin draining. The cyst or fistula opening drains mucus and with swallowing pulls back into your skin. Pain: These cysts typically don't cause pain unless they contain an infection. Difficulty Swallowing or Breathing: In most cases, abnormalities of the branchial cleft are small, but they can become big enough to cause problems with breathing and swallowing. Cosmetic: A lump, dimple or skin tag on the upper shoulder, neck or slightly below the collarbone. The lump may have tenderness or swelling in the neck, typically occurring with an upper respiratory infection. Conservative management where the doctor takes a "watch and wait" approach and provides no treatment is sometimes considered if there's no infection, the condition has been asymptomatic or if a child is not old enough for elective surgery (usually one to two years old). The doctor may prescribe branchial cleft cyst and antibiotic therapy if there's an infection involved. The doctor may recommend branchial cleft cyst surgery to have the branchial cyst removed to prevent infection or other complications. If an infection is present with the cyst, the doctor will likely first treat the infection with antibiotics before performing surgery. If your child has had several infections before the doctor finds the cyst, it could be more difficult to remove the cyst. The physician will typically recommend surgical excision if the cysts are or have been infected, if they're symptomatic or if the diagnosis is uncertain. The doctor will likely recommend complete surgical excision, but it could be a difficult procedure due to being close to the carotid vessels and internal jugular vein which lie deep to these abnormalities. These abnormalities can recur if incompletely excised. Doctors tend to avoid definitive branchial cleft surgery when there’s an active infection or a presence of an abscess. If there are abscesses present, surgical incision and drainage are needed along with antibiotics. If branchial cleft cysts are left untreated, they're prone to abscess formation and recurrent infection with a potential compromise to local structures and resultant scar formation. Although rare, there have been reports of malignancies in branchial cleft cysts, including papillary thyroid carcinoma and branchiogenic carcinoma. The outcome of surgery is usually good. But, cysts can recur, particularly if the surgery occurred during an active infection. Experiencing a little pain following surgery is normal, but if it gets worse and doesn't go away, it could indicate bleeding or infection. The surgeon makes every effort to completely remove the cyst. Sometimes, it can have tracts that the surgeon doesn't detect during surgery. Most patients have the cyst removed successfully with just one surgery and no additional problems. You may need another surgery if it does recur to completely remove it. Treatment outlook for branchial cleft cyst is usually good with surgery when the surgeon is able to completely remove the cyst. You must follow the doctor's instructions to ensure a quick recovery and good prognosis. If you notice a draining pit on your child’s neck or around his or her ear or you suspect your child may have a branchial cleft cyst, schedule an appointment with us at Houston ENT & Allergy Services for treatment and to avoid condition complications. You should seek emergency services immediately if the symptoms of a branchial cleft cyst interfere with your child's ability to swallow or breathe. Please take a look at our other article: What is Branchial Cleft Cyst. And, if you have further questions about Branchial Cleft Cysts, please contact us here at Houston ENT & Allergy Services at 281-623-1312 or complete our online form.